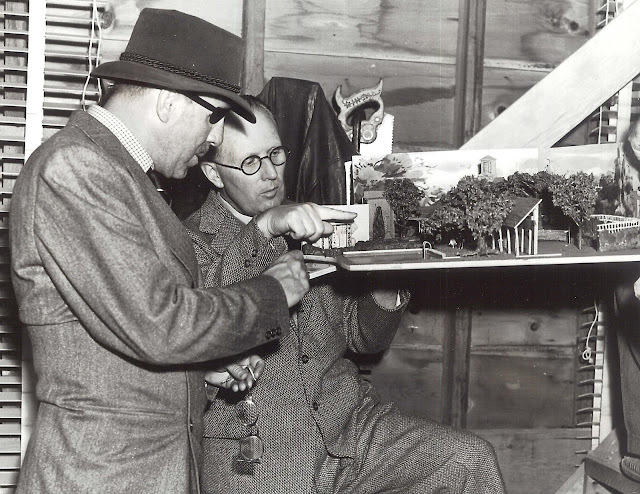 Just how did those fabulous Warner Bros. sets come to be? So many visuals come to mind --- Svengali, Captain Blood, Mildred Pierce, others. 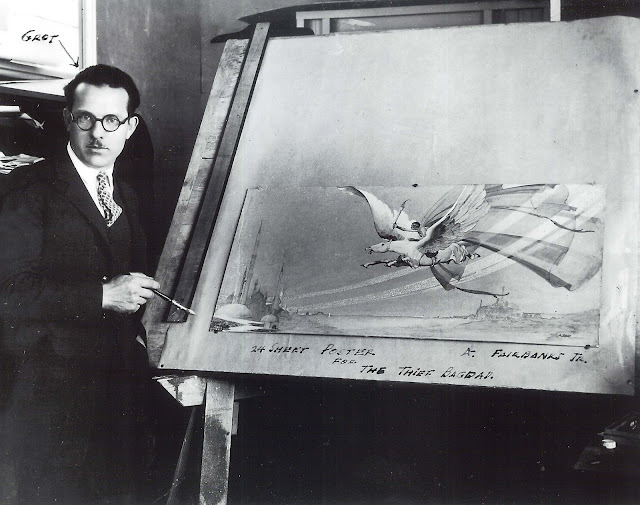 The designer’s art that created miracles on the sound stage had to begin on a smaller scale, and usually it was models such as these that led to the creation of full-scale backdrops, both in the studio and on location. 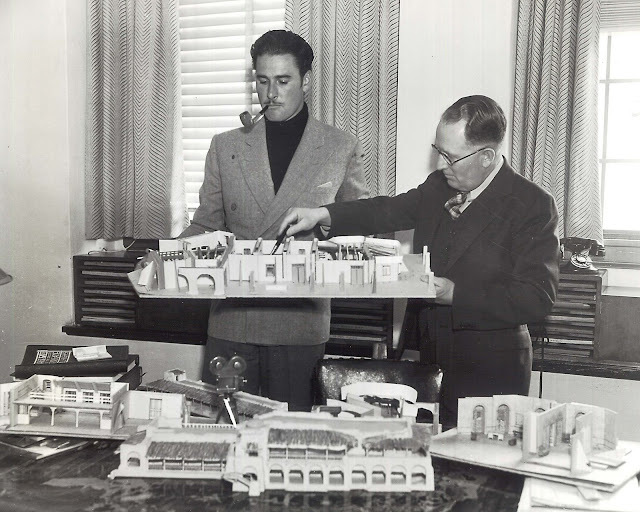 Here we see an example of the latter, as Errol Flynn inspects the model blueprint for one of the forts that will be constructed at Agoura (Lasky Mesa), west of the San Fernando Valley, for the 1936 Charge Of The Light Brigade. That edifice would be re-used the following year in Warner’s Another Dawn, and would even turn up in a Technicolor Sybil Jason short that was featured by Warners as a DVD extra. 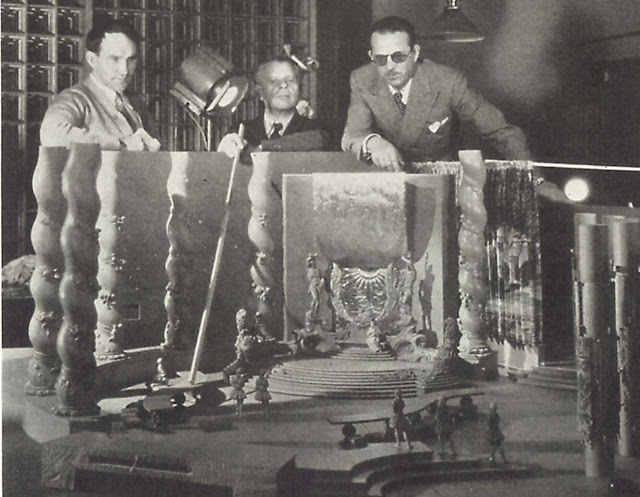 Legendary art director Anton Grot is shown above with director William Dieterle (left) and Max Reinhardt (center) as they inspect a throne room miniature that Grot has assembled for A Midsummer Night’s Dream. It was Grot who gave so many Warner features that distinctive look we associate with the studio, having spent over twenty years there between the late silent period and the beginning of the fifties. One of his early assignments was the poster campaign for The Thief Of Bagdad in 1924. Those incredible one-sheets, based on original paintings by Anton Grot, are among the most collectible of movie posters. Grot is shown putting the finishing touches on the twenty-four sheet for Thief. If the miniatures were replaced in the photographs with electric train sets or slot-car race tracks, I bet the look of concentration on all would still fit. Few people seem to smoke pipes these days, but it seems to have been a booming industry then. I used to smoke a curved stem Sherlock Holmes model when I was fourteen. It might be interesting to know that, besides CHARGE OF THE LIGHT BRIGADE, Lasky Mesa was used as a location for a number of Warner films, including the climatic Indian battle in THEY DIED WITH THEIR BOOTS ON, and a number of scenes in SANTA FE TRAIL. What is especially great is that Laskey Mesa is now a nature preserve protected by the state of California making it off-limits for any kind of developement and allowing it to remain as one of the last great outdoor filming locations near Los Angeles. A hiking trail at the end of Victory Blvd in the Valley leads right up to the Mesa. I was able to walk up there last year and actually stand near where Errol died with his boots on. Considering how cavalier most studios were in preserving their movies, I'd be surprised if something like these were saved. If it wasn't so bad for his health I would ask my partner to smoke a pipe. They are cool. I'd think that a lot of those models would be cannibalized to make others. Thanks ShiningCity for that terrific update on the Light Brigade locations. This was all news to me --- nice to know the place is still more or less intact. I've always wished somebody kept the old newspapers used in montages back then. Wouldn't you love to have one of Charles Foster Kane's editions? But, like the models of the sets, I'm sure nobody saw it as historically significant at the time. Nice post. Hi Shamus --- It occurs to me that someone ought to reproduce those "Kane" newspapers. It wouldn't be that difficult, what with DVD freeze-frame capabilities, etc. Simply a matter of printing, selling, then waiting to be served your summons by Warner's legal department!